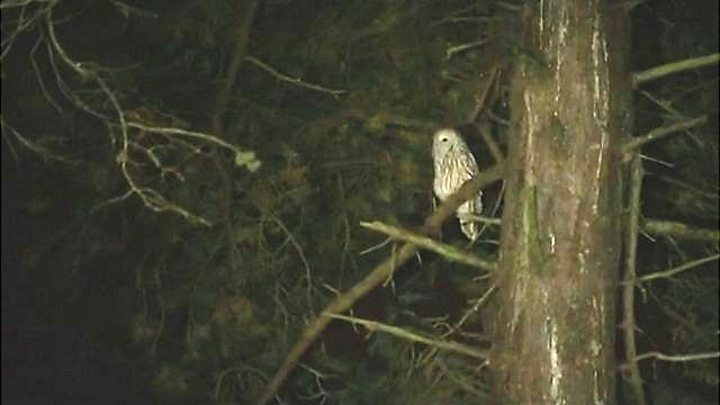 An owl which was spotted on a TV report about her own disappearance has been recaptured. Dawn was one of two birds which escaped from an aviary in Leiston after a gate was accidentally left open two weeks ago. The other owl - Misty - was recovered on Sunday. Dawn was spotted briefly during a BBC Look East news report. She was recaptured earlier after neighbours spotted her in a tree on Thursday. "I couldn't have done it without the help of local people who've been keeping an eye out for her," said aviary owner, Alec Mayhew. "By the time I got up the tree last night, she'd gone. She went up another tree this morning and the net I was using to capture her got caught in branches. "She eventually flew across the road to a housing estate and ended up landing on a garden fence, and that's when I got her safely."